Make: Albert Strange Design, Professionally rebuilt and restored. 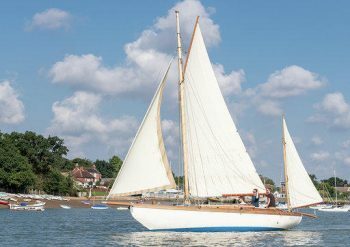 Mist was relaunched in 2017, as a nearly new vessel after an arduous 10 year restoration. She was nominated for the Classic Boat Restoration of 2018. Her professional shipwright owner had saved her from having been sunk in Loch Gare. Scotland. She had been abandoned there and was sat in a dry dock. She has been beautifully restored and fitted with an electric engine. Rigged as a Gentleman’s Gaff Yawl, 1906 an Albert Strange design. Engine Description: Torqeedo – 8hp Cruise 4.0 FP 1251-00 Pod Drive Electric Motor with remote throttle -NEW. Its electrical installation is still required. New 48v Battery. Mist is a Canoe sterned Yawl with a long keel, she is carvel planked with Larch on laminated Iroko and American white Oak frames.Painted in Pearl white. The deck is laid Larch which has been varnished. The superstructure cabin sides is varnished African mahogany. 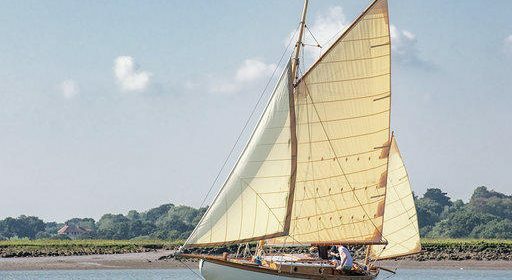 small, engine-less sailing yachts of relatively shoal draft and a pointed canoe-counter stern, a feature which Strange took to ultimate perfection. Single cabin. with 2 x full size berths. a central table. small galley facilities to port of the companionway, with fitted grill and hob. in the fore peak is a sail store. and anchor chain. Accessed via a fore deck hatch. Collapsible water tanks under each berth. Both Summer and Winter covers. Main plough anchor with new chain. Main boom, mizzen boom. the small fixed bowsprit and the bumpkin. Furling stay sail. Main sail with reefing points . Total sail area approx 409 sq ft., All cream in colour and made by North Sea sails in New condition. Safety Equipment: grab rails on cabin roof.